Cromarty Image Library - Cromarty Town Pipe Band - c1939? 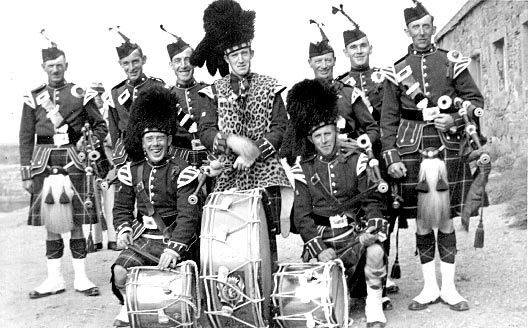 Cromarty Town Pipe Band - c1939? See also picture #484 and picture #485. The big drum was commandeered by the army at the outbreak of war, and went right round the world before being returned. It's now in the Courthouse, and the history of its travels is written on the skin of the drum. The piper on the back row at the far right was known at the time as the Piper of Blazes, he was Margaret Sutherland's father. The band practised at Newton Farm. All rigged out in Seaforth kilts, on one occasion the man with the mace said "Turn left for the Hotel after we leave Victoria Hall". But on this occasion the band kept going along High Street and the leader was 50 yards down Bank Street before he knew what had happened. Just then he threw his stick 50 yards after the band. Piper MacKay in the picture is my late father, Willie John MacKay, who was known locally as "Piper". He died in his 90th year in 1988 having spent most of his working life at Newhall House working as a farm hand for Shaw of Tordarroch. He remained physically fit right up to the last few months of his life and cerainly did some work at Newhall House into his 80's. A lively character, he was good natured and had a definite joy of the simple things in life, perhaps influenced by having been in the Seaforth Highlanders for all of the First World War. After his death, my mother "Isie", one of the Killen Williamsons, moved to sheltered accomodation in Fortrose until she passed away in 1995 aged 80. They had three of a family, Nancy Cameron, the oldest, lives in Balblair; Margaret, (middle one) is married to Kenneth McIver at the Insch Farm in Fortrose and myself, Dave. I have lived in Edinburgh since 1975. My Dad, Willie John MacKay (piper), had great musical ability and could play any instrument apart from the fiddle. He had a great sense of humour and money was never very important to him. He was a very unique person, loved by all including my two daughters, his grand-daughters Pam Sutherland and Heather Sutherland-Fraser who is now married to Darren Fraser. My late husband Willie Sutherland had a high regard for him. Hello Margaret, I remember your Father Mother and yourself. I have many fond memories of Newhall. remember Major Shaws Big Garden!!!!!!!! Also you must remember Archie Mackenzie? ?